Granny has a new addition to her arsenal of crime fighting weapons as Fuchsia, Minnesota's most colorful detective. 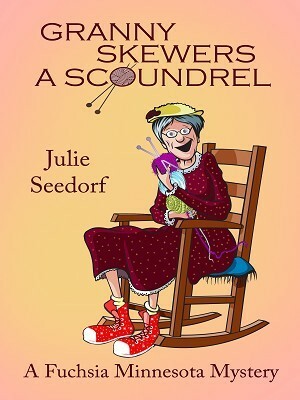 Now, along with her famous crook-hooking umbrella, she's acquired a scoundrel-skewering knitting needle. And just in time! Residents of Fuchsia seem to be dropping dead like flies! First, it's Granny's neighbor Sally (who gives up the ghost in her weed-filled front yard), followed by Esmeralda Periwinkle (the squirrel lover on Main Street), and then, Mr. Nail, owner of the local hardware store (who is squashed when dozens of bags of fertilizer fall on top of him). Granny is baffled. Who is behind this murder spree? Granny enlists the help of her sort of boyfriend Franklin Gatsby, the town's police chief Cornelius Stricknine (or "The Big Guy"), her reality-show loving neighbor Mavis, and her own son Thor. And, of course, the special assistance of her menagerie of pets -- including Mr. Bleaty, the goat. Soon Granny is hot on the trail of this dastardly murderer. Unfortunately, when Granny herself is poisoned, everyone insists that she cool her crime solving ways.